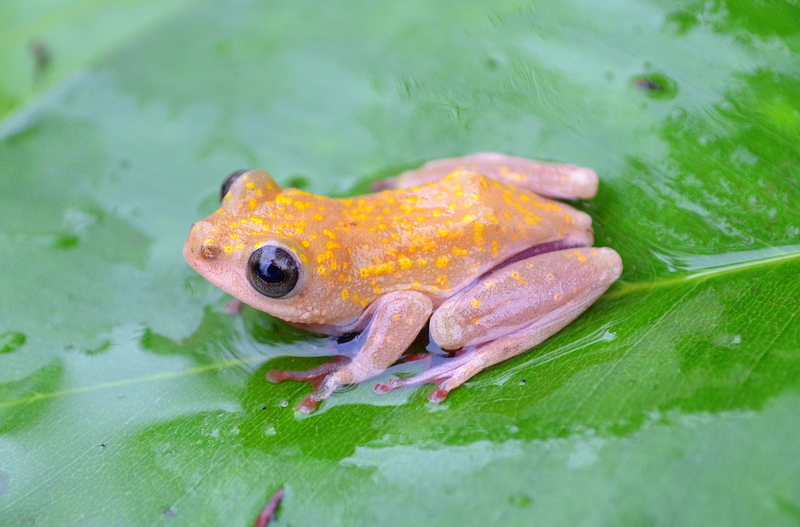 When Smithsonian Conservation Biology Institute conservation biologist Jessica Deichmann joined a project to determine how the construction of a road in Gabon’s Moukalaba-Doudou National Park would affect amphibians in the area, she quickly realized something surprising: the frogs living there are masters of disguise. 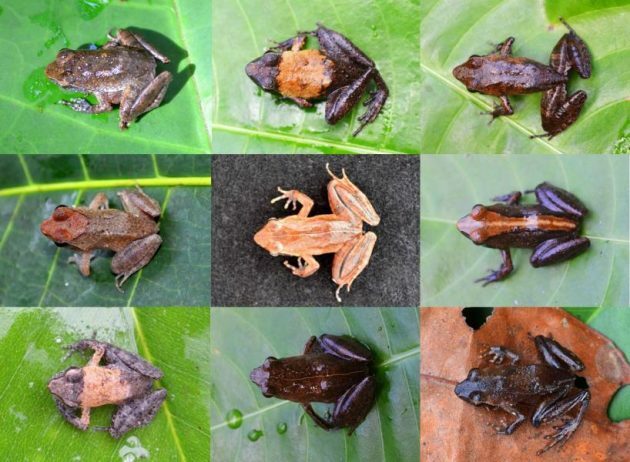 Individual frogs that were different in color, pattern and even shape were actually the exact same species. So Deichmann teamed up with the Smithsonian’s National Museum of Natural History to use a cutting-edge technique—DNA barcoding—to solve the riddle of which species were truly present in the buffer zone, and in what numbers. The results of the study were published recently in the scientific journal PLOS ONE. Q: How was this study site selected? Deichmann: The town of Gamba is remote. Economic growth relies heavily on the construction of a road that would connect Gamba to the towns of Tchinbanga and Mayumba located further south. The sprinkled long reed frog, Hyperolius adspersus, was one of the most common frogs in the area, often found in large choruses in dense grasses. In 2012, the government of Gabon and Shell Gabon contracted a company to build a new road between Loubomo and Moungagara. Shell Gabon requested that SCBI’s Center for Conservation and Sustainability (CCS) conduct a large-scale biodiversity assessment of the area to be impacted by the future road, much of it located in the buffer zone of a national park. We have been working with Shell Gabon for about 15 years to help mitigate the environmental impacts of infrastructure development. Shell Gabon knew that we would provide transparency and rigor in establishing a baseline understanding of biodiversity before construction. Q: What was the primary question you were trying to answer with this study? Deichmann: We wanted to answer the most basic of questions—how many species are present in the area before the construction of the road? How abundant are the different species and what is their distribution along the route the road would take? Are there areas along the route with more biodiversity that might require special adaptations of road design to help protect those animals? When I joined Elie Tobi, lead amphibian investigator, and his team and saw the challenges of identifying these frogs in the field, I was surprised. One of the frog species, the fantastic reed frog (“Hyperolius phantasticus”), collected in the buffer zone of a national park in Gabon. According to Deichmann, these frogs were very difficult to find, even though they were one of the most vocal species in the area. 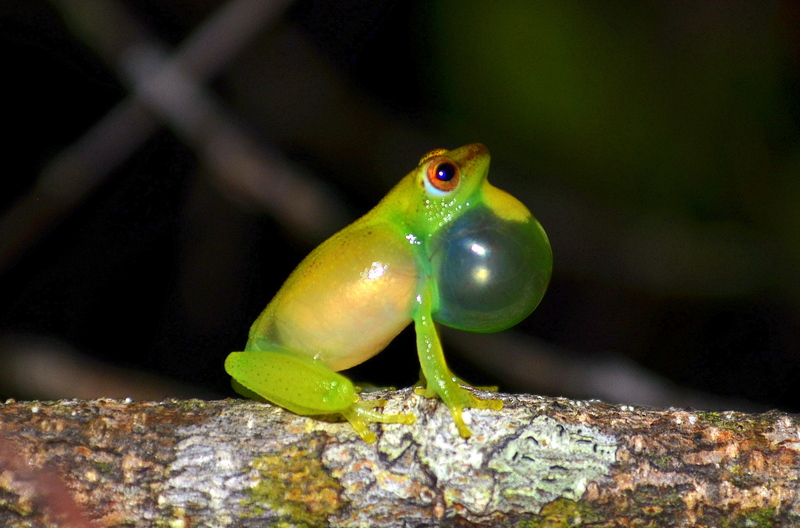 The researchers could hear them everywhere during the wet season, especially at the forest edge and in forest patch. As a biologist who has worked extensively in Central and South America, I’m used to encountering cryptic diversity in the field. Many animals that look the same are actually different species. At our field site in Gabon, it was the opposite problem. Animals that look so different—colors, shapes, patterns, ridges on their backs—were the same species. In talking to Dan Mulcahy of the Smithsonian’s National Museum of Natural History about this challenge, we concocted a plan to use DNA barcoding to get some clarity. We received a grant from the Smithsonian’s DNA Barcode Network to do this work and Mulcahy is one of the co-authors on this paper. The field work team in Gabon collected samples for the DNA barcoding to determine which frog species are present in the buffer zone of Moukalaba-Doudou National Park. From left to right: SCBI’s Elie Tobi; Jean Eric Makaya, road project field assistant; SCBI’s Jessica Deichmann; Axel Litona, then an SCBI Gabon Biodiversity program intern; and Pierre Nicaise Guissiegou, road project field assistant. Q: What did you find by using DNA barcoding? 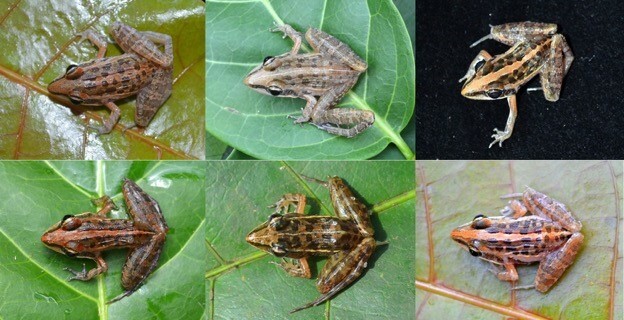 Deichmann: Based on the way the original team identified frogs in the field—using how the animals look as the primary measure—they identified 48 species. With DNA barcoding, we look at the pattern (nucleotide sequence) in a tiny chunk on an individual animal’s DNA. Then, we compare that pattern to the DNA of known species to determine which species the individual belongs to. This barcoding revealed that those 48 are actually only 28 species. By collecting this molecular data and giving a “barcode” to each species, we have created a reference library that biologists working in the field can use to identify species they may come across. By partnering with the Smithsonian’s National Museum of Natural History, we were able to also use specimens from their collections in our barcoding. That expanded our library to species in neighboring areas of Gabon and the Republic of the Congo. Overall, we’ve significantly improved the taxonomic accuracy of species in this area of the world. 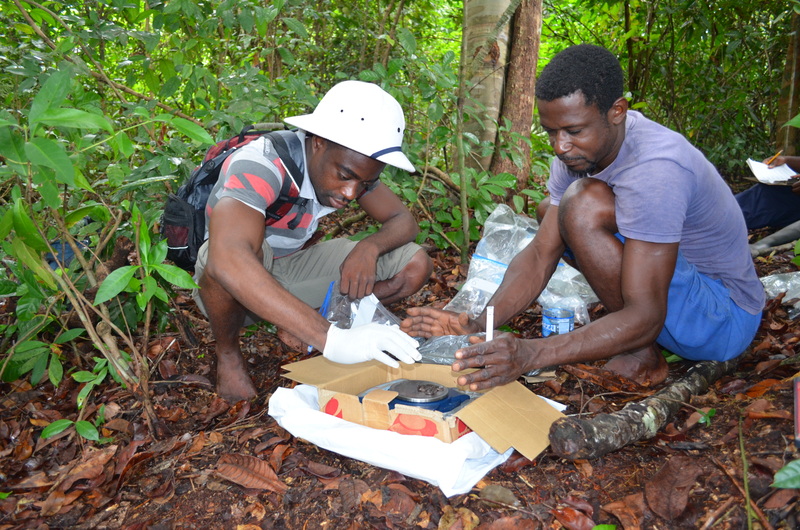 Axel Litona, then an SCBI Gabon Biodiversity program intern, and Pierre Nicaise Guissiegou, road project field assistant, collect data on frogs in Gabon. Q: What is at risk if you thought there were more species than there actually are? Deichmann: In any analysis, results and recommendations can only be as good as the data used to develop them. This leads to inaccurate baselines and makes it impossible to accurately assess changes in amphibian communities. In this instance, one possible repercussion could have been misplacing limited resources for conservation. Here is an overly simplified hypothetical: Imagine there was one species that was identified as three separate species in the field because it comes in red, blue and orange. When ongoing monitoring reveals a decrease in the overall number of red individuals, the company decides to invest financial and personnel resources in designing protections for the red “species,” though the blue and orange individuals of this species are all doing fine, even increasing in some areas. Meanwhile, one of the species that was accurately identified is also showing a decline in numbers, but not as drastically as the red “species,” so the company decides to wait until they have some extra time and money to focus on the second species—but maybe that will be too little, too late. Q: What recommendations did you make to minimize the impact of the road? Deichmann: Under the leadership of CCS’s Hadrien Vanthomme, we developed more than 30 specific recommendations designed to minimize the impacts of road construction on amphibians and other groups and to improve restoration measures after construction was complete. These recommendations included micro-rerouting of the road to avoid specific forest patches and wetlands in the savannah-forest mosaic habitat that the road was crossing and installation of culverts or underpasses for amphibians to cross the road. The DNA barcoding results will also make it possible to monitor specific species populations along the road over time and evaluate how the road is impacting different species. Deichmann: We hope the genetic information we provide in the paper is useful to the broader community working in African amphibian taxonomy and that molecular work continues to identify the species we were not able to put names on given current available information. We would also very much like to return to the areas we sampled now that the road has been built to evaluate how biodiversity has changed.